The Feed Zone Cookbook is recipes designed originally for pro cyclists. It has lots of recipes meals for at home, but also “handhelds,” little things easy to wrap up and pack along on a ride. This is one of those! The book has lots of recipes that use things like rice and chicken, and then other recipes that call for already cooked rice or chicken, with the intent that you make a bunch of extra in the first recipe, and can use it in the second. Heat the oven to 325 degrees. Lightly grease a muffin tin. Combine the rice, eggs, banana, brown sugar, flour, and salt in a blender or food processor. Add the vanilla and cinnamon, if desired. Process until smooth. Slowly add 1/4 cup of milk, then as much of the remaining milk as necessary to get a thick batter. If you are using fresh (just cooked) rice, it should be moist enough that just the first 1/4 cup of milk should suffice. If the rice has been in the fridge several days and dried out, you will probably need to add more milk. 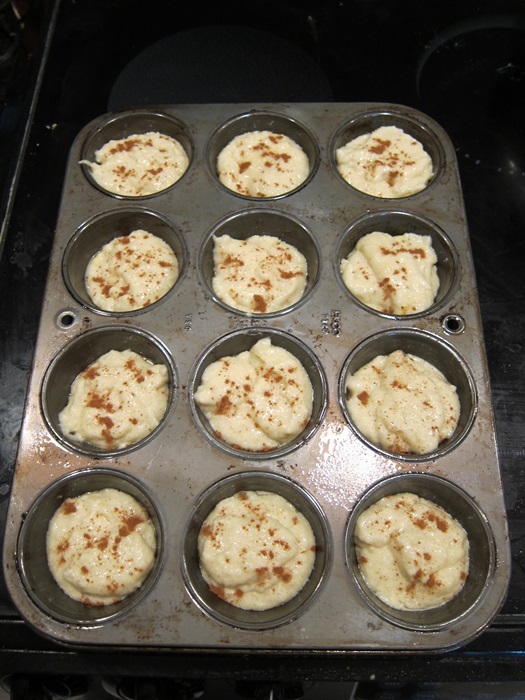 Scoop the batter into the greased muffin tin, filling each about half way. I forgot to put the cinnamon in earlier, so sprinkled a bit on top of each. 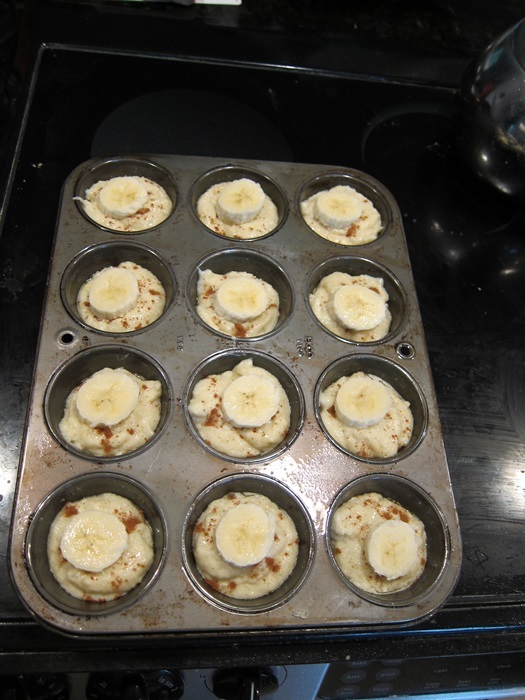 Slice the remaining half a banana and put a slice in the middle of each muffin, if desired. Bake until firm in the center. The book said 15-20, mine took more like 23. Let cool completely in the pan, then gently run a knife around the edge of each muffin to pry out. I had greased heavily enough that they all just came out without any prying at all. Store in the fridge. From The Feed Zone Cookbook. Combine the rice, eggs, banana, brown sugar, flour, and salt in a blender or food processor. Add the vanilla and cinnamon, if desired. Process until smooth. 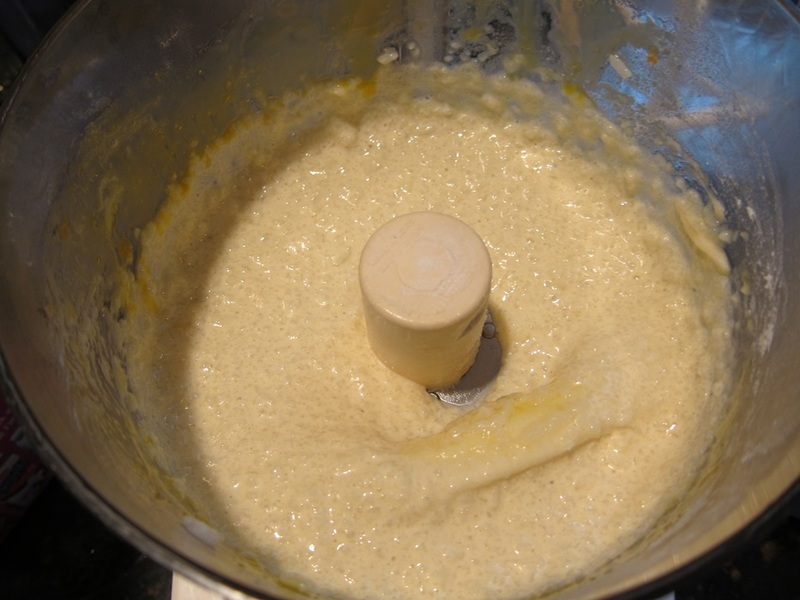 Slowly add 1/4 cup of milk, then as much of the remaining milk as necessary to get a thick batter. Scoop the batter into the greased muffin tin, filling each about half way. 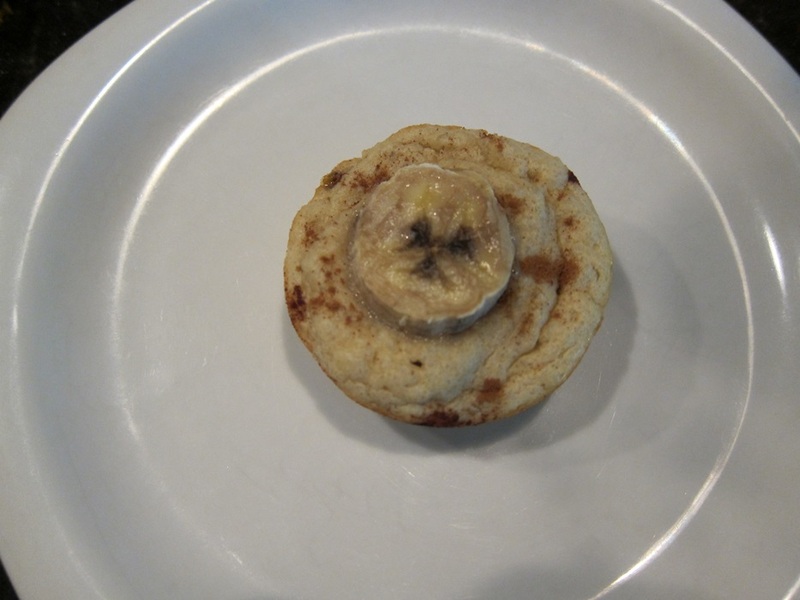 Slice the remaining half a banana and put a slice in the middle of each muffin, if desired. Bake until firm in the center. The book said 18-23. 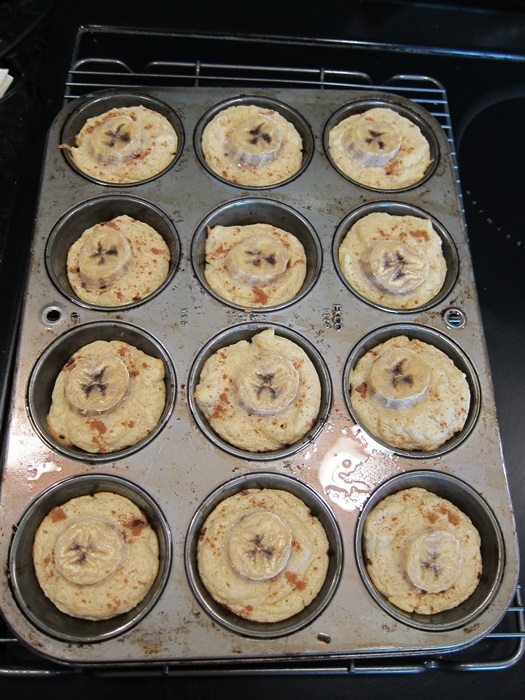 Let cool completely in the pan, then gently run a knife around the edge of each muffin to pry out. Store in the fridge. 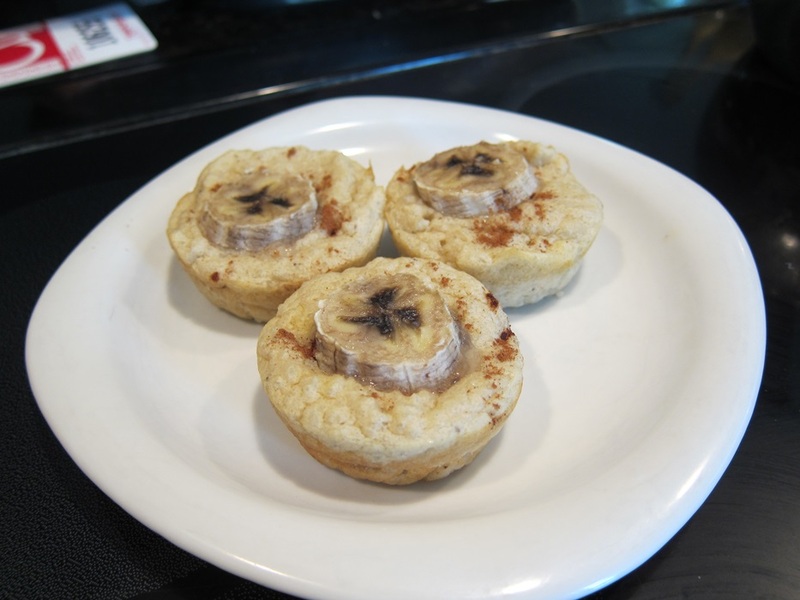 This entry was posted in Energy Food, Snack and tagged Allen Lim, Banana, Muffins, rice. Bookmark the permalink. What do you use to grease the pan? I think I’ll have to try these. Regular baking spray stuff worked well for me!